1Associate Professor,2Post Graduate Student, Department of Physiology, Prathima Institute of Medical Sciences, Nagunur, Karimnagar District, Telangana-505417. 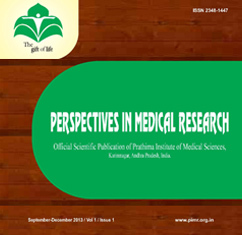 Address for correspondence: Dr Navid N Shah, Associate Professor, Department of Physiology, Prathima Institute of Medical Sciences, Nagunur, Karimnagar District, Telangana-505417. Introduction: There is a increasing amount of verification supporting the view that oxidative stress is involved and plays a important role in the pathophysiology of primary hypertension. Objectives: This research examines the association of blood pressure with blood oxidative stress-related parameters in normotensive and hypertensive subjects. Materials and Methods :A cross-sectional design was applied to 32 hypertensive patients and 33 healthy normotensive subjects. All subjects were men between the ages of 35 and 60 years. Cases of dyslipidemia, diabetes mellitus, obesity, smoking and those taking medication were excluded from the study. In erythrocyte lipid peroxidation (malondialdehyde) and reduced/oxidized glutathione ratio (GSH/GSSG) were determined. Parameters measured in the plasma of test subjects were plasma antioxidant status, plasma vitamin C, vitamin E, lipid peroxidation (8-isoprostane), blood pressure modulators renin, aldosterone, endothelin-1, and homocysteine. Results :Daytime systolic and diastolic blood pressures of hypertensives were negatively correlated with plasma antioxidant capacity (r=-0.54, p=0.001 and r=-0.60, p<0.001), plasma vitamin C levels (r=-0.47, p=0.006 and r=-0.43, p=0.01), erythrocyte activity of antioxidant enzymes, and erythrocyte GSH/GSSG ratio, with hypertensives showing higher levels of oxidative stress. Conclusion :: Blood pressures showed a positive correlation with both plasma and urine 8-isoprostane. These results show a strong association between blood pressure and some oxidative stress-related parameters and propose a probable role of oxidative stress in the pathophysiology of essential hypertension. © PIMR.org.in - 2013. All Rights Reserved.